A question we often get asked at TRJFP Sheffield is “what will you do with your leftovers” after a pop-up. The answer is pretty simple. 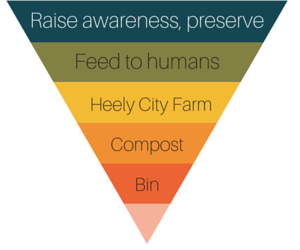 We follow Feedback’s Food Waste Pyramid, with a couple of little changes. We look to increase awareness amongst individuals and businesses to prevent food from being wasted in the first place. Part of this is educating people to use common sense when working out if an item is still usable and the other part is looking in to ways to store, reuse and preserve foods so they last longer. We also dehydrate fruit and veg so it will last a lot longer and we know we’ll have a source of fruits and veg over the winter. This is where our main public focussed activity lies. We actively save food from becoming landfill to cook and serve to humans in our cafe’s. Any bread that is a little too hard or crispy we give to Heeley City Farm to feed their livestock with. Same goes for veg that’s not great for humans but still edible for pigs. This ensures the livestock get a varied diet and is an excellent way to transfer the energy gone in to producing the food. Compost! Our volunteers regularly take home bins full of compostable waste from the pop-ups and at HQ we regularly compost as much as we can. Any herbs or plants we are donated benefit from this compost and we grow veg and herbs to be used in our meals. The bin. Sadly, some items we get are already way passed their useful life. If they aren’t suitable for any other use such as feeding livestock or composting, we have to throw some things away. To reduce the negative impact of this we recycle as much packaging as possible. This simple way of dealing with food can be used in the home too. If you follow the pyramid you too can ensure you’re doing your bit to reduce the amount of wasted food in the UK. We’d love to hear from you if there are other stages in the pyramid that we could incorporate! Comment below and let us know.